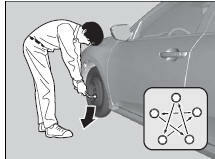 Remove the wheel nuts and flat tire. 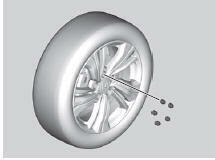 Wipe the mounting surfaces of the wheel with a clean cloth. Mount the compact spare tire. 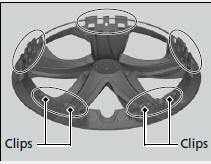 Screw the wheel nuts until they touch the lips around the mounting holes, and stop rotating. 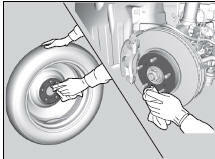 Make sure the wire support ring is hooked into the clips around the edge of the wheel cover. 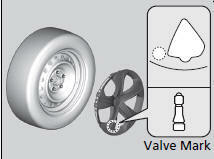 Align the valve mark on the wheel cover to the tire valve on the wheel, then install the wheel cover.